Trademarks are more than catchy representations in miniature of manufactured goods, Mimmo Cozzolino says. He sees them as reflections of a people’s concerns and conditions, as symbols of special historical and social significance. "They are a social reflection because through trademarks you’re trying to talk to that lowest common denominator, the guy who's going to buy this bottle of goo or that can of soup, or whatever. He's got to recognise whose making that thing and so trademarks have got to have a traditional appeal and a general symbology. They've got to be well understood." Trademarks are important historically for the tale they tell of a nation's economic and commercial development. The first registered in New South Wales (in 1865) was for wine and spirits. The first applied for in Victoria, although not granted, was for “British wines, cordials, vinegar and blacking." Five days later, on September 27, 1876, the trademark of the Singer Sewing Machine company of New York, became the first legally registered in the State. For several years, Mimmo Cozzolino has been collecting Australian trademarks for a book he expects soon to publish. It will be part catalogue, part commentary and historical survey, presenting perhaps 1400 of the many thousands of marks registered in this country between 1860 and 1960, first by the individual colonies, but from 1906 by the Commonwealth. He has 7000 marks catalogued on cards typed by his wife, has photographed 3000 of the most striking and holds undimmed hope of rescuing from that limbo into which they have vanished some at least of the estimated 90 per cent of the marks designed in Australia, used fleetingly, but never registered. A few, perhaps many, must be “floating around" yet, unregarded but not lost, he believes. His book is now at the stage where the creative part begins, where he can “start to pick trends", define recurring themes, set symbols in their social context. He is planning a limp-cover volume of 232 pages, with a 16 page section in full colour, but is keeping his options free: “I can cut off my research at any point. I've about three months left before publication– I would like to get it out this year– but I can hold off for six months if necessary. The layout is flexible." He proposes to be his own publisher. "I intend to launch a small publishing company, a one-man operation. I've got a very good accountant who’s well versed in publishing and is trying to talk me out of the idea; but I think there is future is visual books because the young people now growing up with a TV background like to look at pictures more than they like to read a lot. Although the printed book will never go out, I think the visual book will make a place of its own and it should be possible to earn a living from publishing one or two such books a year. I'm not asking to become a new Penguin." Mimmo Cozzolino was born in Naples (“the belligerent Neapolitan," friends are apt to say) and came to Australia, in 1961, when 12. He took a diploma in art at Prahran College of Advanced Education and in 1972 founded his own graphic design and illustration studio with a fellow-student, Con Aslanis, a Greek. The studio, inventively named All-Australian Graffiti, bloomed as a co-operative of seven artists of richly mixed ethnic background - Italian, Greek, Polish Jewish, English, Australian– who worked together for six years before parting to follow independent careers. 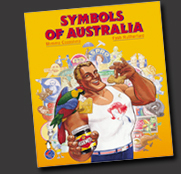 "The Kevin Pappas Tear Out Postcard Book", designed and packaged by All Australian Graffiti and published by Penguin in 1977, was one notable achievement of the group, a joyfully irreverent escape into visual satire from bread-and-butter employment in advertising and the nourishing pastures of commercial art. The postcards, an affectionate yet edged collection of Australian symbols, complement and to some extent perhaps foreshadow Mimmo Cozzolino's catalogue of Australian trademarks. Symbols have fascinated Mimmo Cozzolino since his student days. He came to maturity when the trend in design to the slick, the glossy, the geometric and sterile, was sweeping in from America and Europe. The richness, the imagery, the liveliness and excitement of the old style of symbol was in the discard, forgotten, ignored. A microcosm of Australian social history was disappearing. "A lot of people say ‘What’s this wog doing? What does he know about this Australian thing?’ But what they don’t realise is that the very fact of coming from a different cultural background makes it easier for me to see these things in a different way. Someone who has grown up with them just takes them for granted," Mimmo Cozzolino says. He calculates that a generation nostalgic for tugs from the past is ready to savor the word play, the visual puns, the buoyant fun of the early trademarks. Ready also to accept without distress their obsessive themes– nationalism, White Australia, recognition of dependence on primary products– and to value and preserve the recurring images of rabbits, kangaroos, the Southern Cross, Diggers of both wars, Aborigines, boomerangs, gum trees. He confesses only one dissatisfaction: the artists who designed the marks he has so diligently gathered remain unknown, unsung. “Who, for instance, designed the Rosella logo? I have asked the National Gallery in Canberra and libraries here and elsewhere but they’ve got no idea.